DEADLINE TO ENTER ARTWORK UNTIL FEB 18! We are currently preparing for our 41st Annual GALA Fine Art Auction, Saturday, March 2, 2019. GALA is the Quinlan’s signature fundraiser and sells out every year to discerning art collectors of Georgia. Its success significantly impacts the Center’s ability to offer exceptional visual arts programming to our community. We are excited this year to honor artist David Wendel as our 2019 Artist Guest of Honor. Again this year, a full color catalog selection of auction items will be mailed to ticket holders prior to the event. All art entries will be juried. The deadline for ready to hang artwork is between January 7-11, 2019 (for catalog consideration.) Deadline to participate in the auction is February 18, 2019. A panel of artists, curators and collectors will review GALA 2019 submissions and accept 100 pieces for the auction. It is suggested that artists who would like to be featured in the auction submit their best work and those who want to be considered for the catalog submit by January 11 to ensure that their work has the opportunity to be viewed by the entire panel. Panelists do consider the following in making their selection: overall artistic excellence, retail price point and if the work is donated or a percentage of the sale is selected. Artists are our most significant group of supporters, and we especially value your participation. 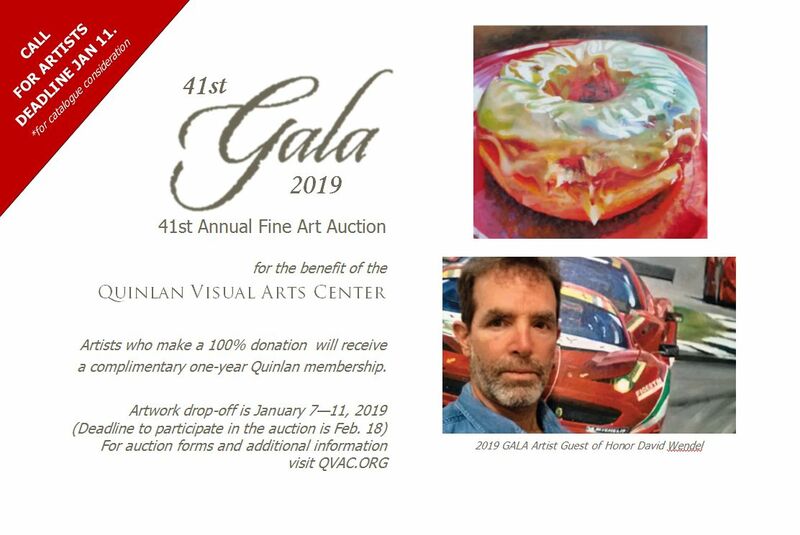 With your valuable contribution, the Quinlan will continue to promote working artists and provide art education programs for all members of our community, making 2019 a truly exceptional year! We thank you.